The City of Santiago Atlatongo, North of Mexico City has been turned into an autonomous zone with residents securing barricades at the entrances. 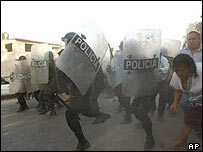 The situation began when police, who attempting to make an arrest, were attacked for allegedly not having a warrant. Four officers were injured. Since then the barricades have gone up, and the central government has sent 250 more officers to quell the uprising. Three of whom have become hostages.